William Burroughs closed his classic debut novel, Junky, by saying he had determined to search out a drug he called 'Yage' which he believed transmitted telepathic powers, a drug that could be 'the final fix'. In The Yage Letters - a mix of travel writing, satire, psychedelia and epistolary novel - he journeys through South America, writing to his friend Allen Ginsberg about his experiments with the strange drug, using it to travel through time and space, to derange his senses - the perfect drug for the author of the wild decentred books that followed. 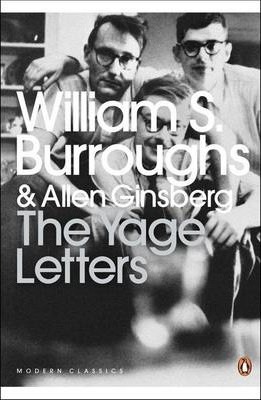 Years later, Ginsberg writes back as he follows in Burroughs' footsteps, and the drug worse and more profound than he had imagined. Allen Ginsberg (1926-1997) was an American poet, best known for his iconic Howl, one of the most widely read and translated poems of the century. He was inducted into the American Academy of Arts and Letters, was awarded the medal of Chevalier de l'Ordre des Arts et des Lettres by the French Minister of Culture, and won the National Book Award for The Fall of America. William S. Burroughs was born on February 5, 1914 in St Louis. In work and in life Burroughs expressed a lifelong subversion of the morality, politics and economics of modern America. To escape those conditions, and in particular his treatment as a homosexual and a drug-user, Burroughs left his homeland in 1950, and soon after began writing. By the time of his death he was widely recognised as one of the most politically trenchant, culturally influential, and innovative artists of the twentieth century. His numerous books include Naked Lunch, Junky, Queer, Nova Express, Interzone, The Wild Boys, The Ticket That Exploded and The Soft Machine. After living in Mexico City, Tangier, Paris, and London, Burroughs finally returned to America in 1974. He died in 1997. Oliver Harris is professor of American literature at Keele University and the editor of The Letters of William S. Burroughs, 1945-1959 (1993), Junky: the Definitive Text of "Junk" (2003), The Yage Letters Redux (2006), and Everything Lost: The Latin American Notebook of William S. Burroughs (2008). He has published articles on film noir, the epistolary, and Beat Generation writing and the book William Burroughs and the Secret of Fascination (2003). He is currently co-editing Naked Lunch@50: Anniversary Essays (2009) and working on a new twenty-fifth anniversary edition of Queer (forthcoming in 2010).